Ann Cleeves has twice been short listed for a CWA Dagger Award - once for her short story The Plater, and the following year for the Dagger in the Library award. In 2006 she won the Duncan Lawrie Dagger Award for best crime novel of the year for Raven Black, the first volume of her Shetland Quartet. Now comes the follow up, White Nights. SHOTS asked Ann to tell us about the new book and why the sense of placement is so important to her. I first visited Shetland more than 30 years ago. I’d dropped out of university and an acquaintance phoned up out of the blue to ask if I fancied being assistant cook at the Bird Observatory on Fair Isle. The observatory was desperate for seasonal staff, he said. Obviously desperate, because I couldn’t cook and knew nothing about birds. I wasn’t even sure where Fair Isle was. But it was an adventure and it was work, so I went. Fair Isle is the most southerly of Shetland’s islands, about half way between Orkney and Shetland mainland. I loved Shetland. It’s not a pretty place - it can be hard and bleak - but it has a drama that appealed to me immediately and I arrived in the spring when it’s softened by masses of wild flowers and seabirds. Fair Isle was full of gossip and stories – great preparation for a writer of fiction. I worked there for two seasons and like all the observatory staff I got involved in the rituals and rhythms of island life. We helped with the harvest and to round up the sheep for clipping. There were dances and weddings and the week was marked by the return trip of the mail boat on Tuesdays and Fridays. 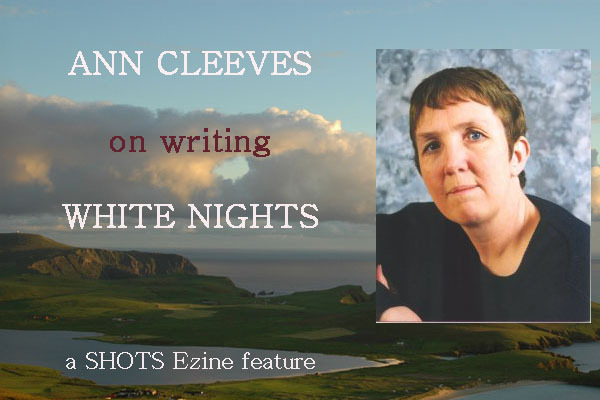 White Nights is the second book in the Shetland Quartet and uses my Fair Isle experience more than the first novel. Raven Black is set in mid-winter. Although I’ve visited Shetland in the darkness of January, I haven’t lived there in the winter months. The first book is about what it is to be an outsider, about teenage loneliness. It introduces my central character Jimmy Perez who, although his family has lived in Shetland for hundreds of years, is something of an outsider himself. His ancestor was a Spaniard, shipwrecked from an Armada boat. Perez has a strange name and Mediterranean colouring. And he’s a Fair Islander. He’s worked in the south, only coming back to Shetland when his marriage breaks down. He always saw his future as a crofter, but when that possibility arises in Raven Black, he’s ambivalent about moving home to Fair Isle. He decides after all to remain a cop. Any second book is tricky, especially if the first has been well received. There’s the weight of expectation, besides the danger of becoming stale and repetitive. I hadn’t intended more than one book to be set in Shetland – it was only when my German publisher wanted details of the rest of the series, that I jotted a brief synopsis for the next three books. It took no more than ten minutes and hardly seemed real then. I didn’t really think the deal would be made. Coming back to the scrappy description a year later, I was horrified. Could I really turn this outline into a believable novel? The synopsis featured a stranger to the islands who seemed to be suffering from amnesia and was then found dead. It didn’t seem much of a plot. Then Ingirid, a close Shetland friend described seeing a young fiddle player perform. ‘He’s such a showman,’ she said. ‘He fell to his knees, still playing and he didn’t miss a beat.’ That image stayed with me and fed into the story. White Nights is set in mid-summer, in what Shetlanders call ‘the simmer dim’. I spent two summers in the islands, and the writing allowed me to revisit the Shetland of my youth. I did go north to stay with Ingirid for a week in June when I was working on the book, but it was continually pouring with rain and didn’t provide the atmosphere I was looking for, so I had to rely on memory and imagination. In good weather this far north midsummer is a strange time of light evenings and no real night. The sun slides towards the horizon and then climbs back into the sky again. I wanted the new book to be less gloomy, less dark than Raven Black. It’s about the glitter of celebrity and about deception; this is the time of year when nothing is quite as it seems. The book is set in the fictional community of Biddista. Artist Bella Sinclair grew up there and now that she’s famous she still lives in the big house on the hill, the former Manse, where admirers have always gathered to celebrate her work and feed her ego. The Herring House Gallery on the shore nearby exhibits her paintings. She creates illusions in her art and in her life. It’s appropriate that the stranger who seems to lose his memory is an actor. Her nephew, fiddle player Roddy Sinclair is another professional performer and myths have already started to grow around him. Also living in Biddista are Kenny and Edith Thomson and I enjoyed writing about them very much. I wanted a love story between middle-aged people who have had to redefine their relationship over the years. They married because it was expected – a choice of partners in such a small community would be limited after all! Kenny is a crofter, turned farmer, who still works the land in a traditional way. Edith has become a professional woman: she manages a care home for Shetland Islands Council. Her horizons have been broadened by her reading and by training trips to the south. But as the couple’s interests have diverged, their respect and affection for each other has developed. Now there’s a tenderness, even a sexiness, between them that was missing in the early days. I started writing crime fiction because I grew up reading the Golden Age novels of Sayers and Allingham. Setting stories in Shetland gives me the opportunity to write the sort of traditional rural murder mystery I enjoyed as a child. There are few other places in the UK where this would be credible today, but here we have the enclosed community, a way of life rooted in the landscape, the secrets it’s almost impossible to hide. However, the Shetland of the twenty first century has contemporary problems and issues and to prevent the novels from becoming a pastiche of earlier detective stories, it’s important to consider those too. This is a real place, not some southerner’s dream. The oil that has provided affluence for nearly half a century is starting to run out, some of the young men drink too much, apparently there’s a lot of depression. If tourism is encouraged to replace oil income, will the islands become a glorified theme park of spinning, knitting and music? I don’t have the answer to these questions but I enjoy exploring them through the fiction.